The hostel was more then I expected! It felt as though I was staying in a hotel because the facility was very bright, clean, airy and relaxing. The outdoor patio is a gem! Very peaceful and a perfect spot to enjoy your coffee in the morning. The breakfast offered at the hostel for a small surcharge gave enough options and was very satisfying. I felt very safe, location was stellar! Close to the metro and minutes from major tourist attractions. Awesome free walking tour! Highly recommend!! Great location, quiet, staff was super friendly and the rooms were really cute! This is the nicest hostel I’ve stayed at for a reasonable price. Big, clean common areas, secure lockers, helpful staff, and nice facilities. Kitchen and fridges are available, as well as laundry , WiFi, and hot water in all the bathrooms (no matter what time you take a shower) My only suggestions are to change the bathroom lights (they are motion sensitive and turn off while you use the toilet) and add fans, so the air doesn’t get so humid/moisture filled. This hostel was in an excellent location with easy access to any place you would want to be in Barcelona, felt exceptionally safe, and was incredibly cheap especially considering what a cute and well maintained place it was. Other reviews say that the atmosphere isn't good for meeting other people which I suppose could be true, but I thought that it felt very friendly and warm. My only mild annoyance was that it felt like the showers were a bit hard to use, but they were certainly clean. We had a great 2 night stay, comfortable beds and ensuite batrooms were the perks for my friends first time hostel visit. Lovely patio and common area. Easy location would recommend for a quiet break. We had such a great stay here! Very close to a metro stop and about a 15 minute metro from the Gothic quarter. The vibes are great — plenty of common spaces to work or lounge and an awesome terrace! Such a great hostel. Very relaxing with nice facilities and in a great part of Barcelona. Had more of a hotel like ambience to it but I loved that aspect of it! The common area and patio are also very relaxing and a great place to spend the evening in. Would definitely recommend and stay there again. 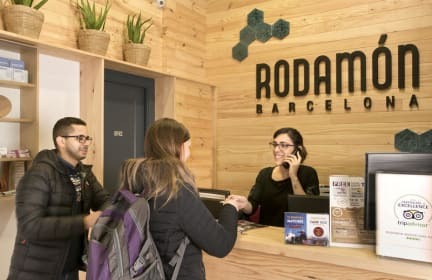 Rodamon is great if you're looking for a quiet, clean and aesthetically pleasing hostel. Having said that however there is no atmosphere. It's basically like staying in a hotel with dorm beds. The staff were impersonal and the guests all kept to themselves. I found how the main common area and kitchen were closed down by 11 to be a bit annoying and the showers to be cramped with nowhere to hang your things inside. An old, possibly homeless man (around 40-50 years old) was placed in our room and made us feel very uncomfortable. After asking at the front desk if we could switch rooms or upgrade to a private room they told us it was not possible. We ended up booking a hotel and leaving the hostel with no refund. It was very unfortunate and I wish they had done more to try and help us in our situation and make us feel more comfortable.